Located near the bus station, and next to the American Consulate, this hotel offers easy access to the Tijuana Cultural Center and other attractions. The outdoor pool, gym, restaurant and lobby bar are convenient for downtime. 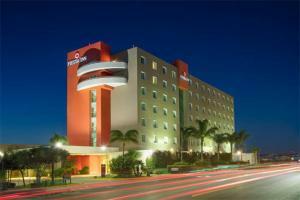 142 rooms and suites, offer Wi-Fi/high-speed access, air-conditioning, a flat-screen TV, and reading chairs. The hotel offers accommodations with accessible features.